The following chapter was based on the following article, previously published in Educational Technology. Lee, S. J., & Reeves, T. C. (2007). Edgar Dale: A significant contributor to the field of educational technology. Educational Technology, 47(6), 56. How can teachers use audiovisual materials to promote learning that persists? How can audiovisual materials enable students to enjoy learning through vicarious experience? These were two of the many important research and development questions addressed by an extraordinary educational technology pioneer, Edgar Dale. Although he is perhaps best remembered today for his often misinterpreted “Cone of Experience,” Dale made significant contributions in many areas as evidenced by just a few of the titles of the many books he wrote during his long lifespan (1900-1988), including: How to Appreciate Motion Pictures (1933), Teaching with Motion Pictures (1937), How to Read a Newspaper (1941), Audiovisual Methods in Teaching (1946, 1954, 1969), Techniques of Teaching Vocabulary(1971), Building a Learning Environment (1972), The Living Word Vocabulary: The Words We Know (1976), and The Educator’s Quotebook (1984). Born in 1900 at the dawn of a new millennium, Edgar Dale’s work continues to influence educational technologists in the 21st Century. Dale grew up on a North Dakota farm, and according to Wagner (1970), he retained the no-nonsense thinking habits and strong work ethic of his Scandinavian forebears throughout his illustrious career. While working on the family farm and later as a teacher in a small rural school, Dale earned both his Bachelors and Masters degrees from the University of North Dakota partially through correspondence courses. In addition to his own prolific scholarship, Edgar Dale mentored an outstanding cadre of doctoral students during his long role as a professor at Ohio State University (1929-1973), including Jeanne Chall and James Finn. Dale also served as President of the Division of Visual Instruction (DVI) of the National Education Association (NEA) from 1937-38, the professional association that is now known as the Association for Educational Communications and Technology (AECT). Although he traced his ideas back as far as Pestalozzi (1746 – 1827), who pioneered the concept of learning through activity, and Froebel (1782 – 1852), who first promoted the principle that children have unique needs and capabilities, Edgar Dale’s work was most heavily influenced by John Dewey (1859-1952). Dewey stressed the importance of the continuity of learning experiences from schools into the real world and argued for a greater focus on higher order outcomes and meaningful learning. 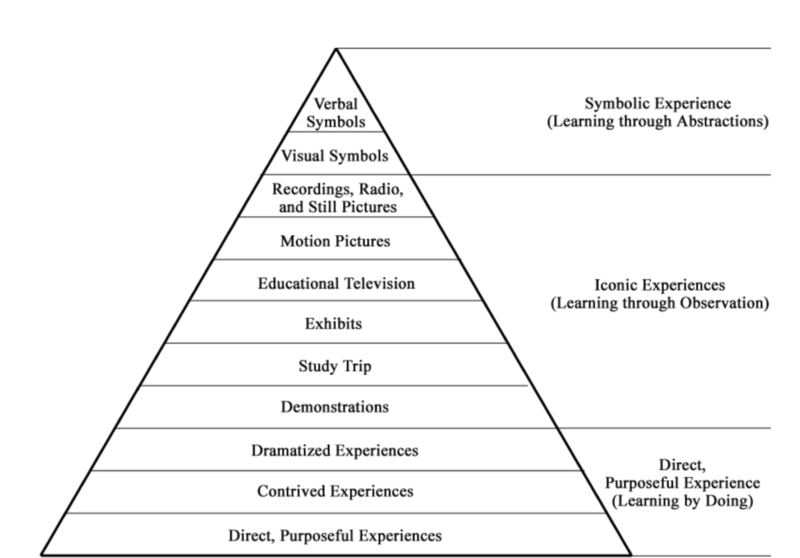 In his first edition of Audiovisual Methods in Teaching (1946), Dale expanded Dewey’s concept of the continuity of learning through experience by developing the “Cone of Experience” which relates a concrete to abstract continuum to audiovisual media options (Seels, 1997). Dale (1969) regarded the Cone as a “visual analogy” (p. 108) to show the progression of learning experiences from the concrete to the abstract (see Figure 1) rather than as a prescription for instruction with media. In the last edition of Audiovisual Methods in Teaching (1969), Dale integrated Bruner’s (1966) three modes of learning into the Cone by categorizing learning experiences into three modes: enactive (i.e., learning by doing), iconic (i.e., learning through observation), and symbolic experience (i.e., learning through abstraction). Figure 1. Dale’s Cone of Experience. In moving toward the pinnacle of the Cone from direct, purposeful experiences to verbal symbols, the degree of abstraction gradually increases. As a result, learners become spectators rather than participants (Seels, 1997). The bottom of the Cone represented “purposeful experience that is seen, handled, tasted, touched, felt, and smelled” (Dale, 1954, p. 42). By contrast, at the top of the Cone, verbal symbols (i.e., words) and messages are highly abstract. They do not have physical resemblance to the objects or ideas. As Dale (1969) wrote, “The word horse as we write it does not look like a horse or sound like a horse or feel like a horse” (p. 127). Dale (1969) explained that the broad base of the cone illustrated the importance of direct experience for effective communication and learning. Especially for young children, real and concrete experiences are necessary to provide the foundation of their permanent learning. The historical importance of Dale’s Cone rests in its attempt to relate media to psychological theory (Seels, 1997) and the Cone has shaped various sets of media selection guidelines ever since. For example, influenced by Dale, Briggs (1972) delineated general principles for media selection according to the age of learners, the type of learners, and the type of task. Dale’s Cone of Experience continues to influence instructional designers today in both theory and practice. 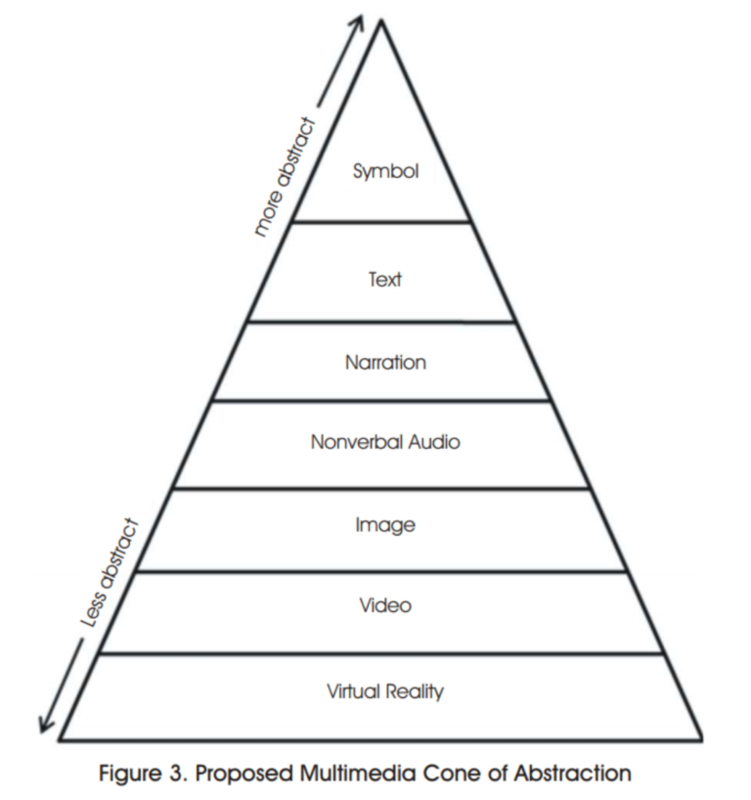 For example, Baukal, Auburn, and Ausburn built upon Dale’s ideas in developing their Multimedia Cone of Abstraction [https://edtechbooks.org/-Yq], available at https://edtechbooks.org/-Yq. As noted above, Dale’s Cone has been frequently misunderstood and misused. Dale’s Cone is often confounded with the “Remembering Cone” or “Bogus Cone” (Subramony, 2003, p. 27) which claims that learners will generally remember 10 percent of what they read, 20 percent of what they hear, 30 percent of what they see, 50 percent of what they hear and see, 70 percent of what they say, and 90 percent of what they both say and do. Even though Dale did not mention the relationship between the level of the Cone and a learner’s level of recall, many practitioners mistakenly believe that the bogus “Remembering Cone” was Dale’s work. A Google search reveals an astonishing number of attributions of the “Bogus Cone” to Edgar Dale. Molenda (2003) concludes that the so-called empirical evidence for the “Remembering Cone” appears to have been fabricated by petroleum industry trainers in the 1960s. In addition to this confusion, the implications of Dale’s Cone have been misunderstood or misapplied. For example, Dale’s Cone has been used to maintain that more realistic and direct experience is always better. However, Dale (1969) demurred, writing that, “Too much reliance on concrete experience may actually obstruct the process of meaningful generalization” (p. 130). Also, Dale noted that providing realistic learning experiences may not be efficient in terms of cost, time, and efforts. Instead, Dale suggested that teachers should balance combinations of concrete and abstract learning experiences. For a thorough analysis of the prevalence of the “Remembering Cone” myth in instructional design, along with analysis tracing the history of this myth and the evidence against it, see the final issue in 2014 of Educational Technology, which presented a special issue on the topic. students can develop their own dynamic experiences. Dale believed that audiovisual materials could help students learn from others’ first-hand experience, or vicariousexperience. Dale (1967) claimed, “Audiovisual materials furnish one especially effective way to extend the range of our vicarious experience” (p. 23). Dale concluded that audiovisual materials could provide a concrete basis for learning concepts, heighten students’ motivation, encourage active participation, give needed reinforcement, widen student experiences and improve the effectiveness of other materials. Dale recommended that researchers should look at the effects of combinations of media in the environment where they will be used rather than the testing of a single, isolated medium in the laboratory. By conducting research in real classrooms, the varied combinations of possible factors such as attributes of audiovisual materials, how to use and administer them, learners’ characteristics, and learning environments could be examined because learning occurs through dynamic interaction among the learner, the context, and the media. Although the experimental methods of educational and psychological research were focused on testing the tenets of behaviorism and pitting one media against another throughout most of his career, Dale was prescient in his recognition that the complexities of learning render most such studies fruitless. Dale was much more than a scholar isolated in the ivory towers of academe. As described by Wagner (1970), “He actively fought for better schools, academic freedom, civil rights, and other causes long before these became popular issues” (p. 94). Dale also anticipated the still-neglected importance of media education by promoting in the 1930s the then radical notion that teachers should help their students to understand the effects of media on them, their parents, and society, and to learn how to critically evaluate the contents of the radio, newspapers, and films. Dale was a socially responsible researcher, a thoughtful humanist, and dedicated educator. Any educational technologist seeking inspiration for their work in our field would find no better role model than Edgar Dale. Think about your most memorable learning experience. How was it (or how was it not) a “rich experience” as defined by Dale? Dale felt that a rich experience would be “emotionally rewarding” and “motivate [learners] for learning throughout their lives.” Describe an experience you have had that was emotionally rewarding and motivated you to continue learning throughout your life. Why does Dale suggest teachers balance their time providing concrete and abstract teaching opportunities? Briggs, L. J. (1972). Students’ guide to handbook of procedures for the design of instruction. Pittsburgh, PA: American Institutes for Research. Bruner, J. S. (1966). Toward a theory of instruction. Cambridge, MA: Harvard University. Dale, E. (1933). How to appreciate motion pictures. New York: Macmillan Company. Dale, E. (1935). The content of motion pictures. New York: Macmillan Company. Dale, E. (1937). Teaching with motion pictures. Washington, DC: American Council on Education. Dale, E. (1941). How to read a newspaper. Chicago: Scott Foresman & Company. Dale, E. (1946). Audiovisual methods in teaching. New York: Dryden Press. Dale, E. (1954). Audiovisual methods in teaching (Revised ed.). New York: Dryden Press. Dale, E. (1967). 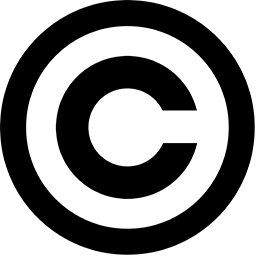 Can you give the public what it wants? New York: World Book Encyclopedia and Cowles Education Corporation. Dale, E. (1969). Audiovisual methods in teaching (3rd ed.). New York: Dryden Press. Dale, E. (1972). Building a learning environment. Bloomington, IN: Phi Delta Kappa Foundation. Dale, E. (1984). The educator’s quotebook. Bloomington, IN: Phi Delta Kappa. Dale, E., & O’Rourke, J. (1971). Techniques of teaching vocabulary. Elgin, IL: Dome. Dale, E., & O’Rourke, J. (1976). The living word vocabulary: The words we know. Elgin, IL: Dome. De Vaney, A., & Butler, R. P. (1996). Voices of the founders: Early discourses in educational technology. In D. H. Jonassen (Ed. ), Handbook of research for educational communications and technology (pp. 3-45). New York: Macmillan. Dewey, J. (1938). Experience and education. London: Collier-Macmillian. Subramony, D. P. (2003). Dale’s cone revisited: Critical examining the misapplication of a nebulous theory to guide practice. Educational Technology, 43(4), 25-30. Wagner, R. W. (1970). Edgar Dale: Professional, Theory into Practice, 9(2), 89-95.